Pointy end goes in the other man. or being decapitated or (by Saint Agatha!) tortured under Oligarchy where the rulers are bribed by the purse. Perhaps the weapon in question is a mace with 4 spikes around a thrusting point? A mace seems like the most plausible interpretation to me. I don't know what made me think of war hammer. I guess it was seeing the three spikes, and thinking that the one looked like a top spike, and the second a back spike. But a mace makes more sense here. On the right hand side, a messer-type sword with a very long grip, and a surprisingly short blade, in proportion to the grip. I have generally omitted curved bladed swords from these images since they are quite common, and therefore not that unusual. In this case, the sword wielded in the upper right of the image seemed fairly distinct with the notch in its blade. Perhaps others better informed about these sorts of swords can clarify for me. Also note the sword lying at the bottom of the image. 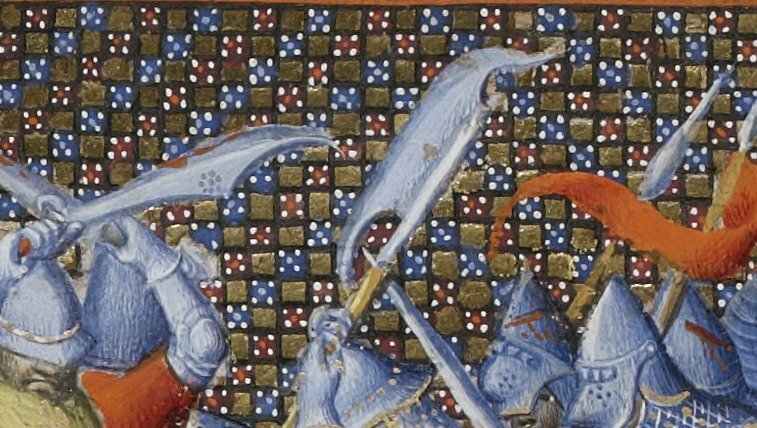 The polearm on the right is particularly striking. Another polearm. Sorry about the image quality; it's not great on Manuscript Miniatures either. A rather interesting polearm held by one of the three sleeping soldiers. A blade with that kind of circular notch out of the back is shown in Armi Bianche Italiane, from memory ... lots of good real 'fantasy' weapons are shown in that book. The warrior with the Teutonic Knight's cross (although he's not a Teutonic Knight) has the weapon of interest here. The warrior with the large shield looks like he has some sort of club. Appropriately, it's from the Livre des Merveilles. Also from the Livre des Merveilles, another unusual polearm. A club with two heads. A massive bow, here wielded by a wild man. 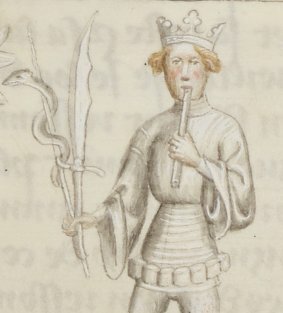 A third example of the peculiar weapon found in the Queen Mary Psalter. Either that, or it's a strange form of falchion- take your pick. The soldier here wields a fairly impressive sling. The image is sourced through the BNF's Mandragore site, http://mandragore.bnf.fr/html/accueil.html , which has low resolution on the images. Fortunately, the BNF also has this manuscript available through it's Gallica site, http://gallica.bnf.fr/ , which has higher resolution and zoom function. A giant club belonging to a now slain giant in Guiron le Courtois. What's interesting is to compare and contrast this club with much of the modern fantasy artwork, which would most probably represent the club as having a head many times more massive than the one shown, and most likely a far shorter haft on the weapon. Even in creating this fantasy weapon, the medieval artist clearly shows an awareness of the weapon's form and function that many modern artists are either unaware of, or indifferent towards. Another long-gripped weapon from a copy of Ovid's Metamorphosis, BNF Français 373 fo.229r, c. 1400. This one is post-medieval, judging from the appearance of the hilt, but does fit well into the category of fantasy-type weapons. Source: The photo is Zach Luna's, taken at the British Museum.